This post is dedicated to all of the couples who chose us for their wedding. A handful of you knew us back when it was just me, Liz, officiating by myself, and there are so many of you who picked us along the way. I don’t know the exact count of how many weddings we have been a part of, but it’s certainly over the 300 mark. It’s insanely unbelievable for me to write that number. When I first started Liz Rae Weddings, I never expected anyone would even want to hire me. But 300 of you hired us. 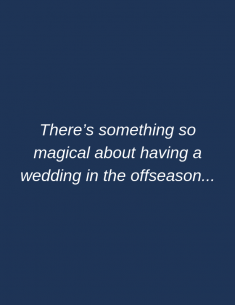 I still get excited every time someone emails us or sends us a message through a wedding site. I still become giddy to write holiday cards to every couple each year, even though it takes me at least a month to write all of them now. Yes, I still handwrite every single one. 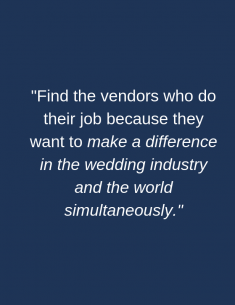 Choosing a vendor to play a role in your wedding day is a huge deal, whether that’s the photographer, the caterer, the florist, whoever it may be. For the couples who weighed the significance of a wedding officiant, especially hiring someone they didn’t know, thank you for hiring us. Thank you for always making our days by emailing us to gush about your wedding — your hopes, your visions, your love story. You’ve opened your lives up to us, and that’s a vulnerable thing to do with a stranger. Thank you for sharing your time with us. It takes hours to write a ceremony, and you’ve devoted time with us, sharing stories over cocktails, reliving your relationship together, divulging your entire lives in our hands and entrusting us to write it into something beautiful. You’ve come to us with ideas and you’ve accepted the ideas we have thrown your way, whether they were fantastic or just plain awful. You’ve given us the space to be creative, and we can’t be thankful enough for that. We didn’t become wedding officiants because it is easy. It’s certainly not. We became officiants because we believe there needs to be more quality writing in the world and every story should be heard, beautifully. It’s been an honor to be given the chance to spend every weekend obsessing over words, sharing your story with your families and friends, and being just a small part of your lives. You didn’t need to hire someone. You could have easily asked a friend to officiate for free. Yet, you chose us, and maybe it is emotional to say this, but you have touched our lives in every possible way. You remind us what love is, why we celebrate love, and why writing is important, especially the words chosen for your wedding day. Thank you for everything. We are so thankful for you, and we hope your Thanksgiving is shared with the family and friends who are so lucky to know you. Should You Get Married in Winter? 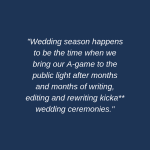 Previous Post:What is Wedding Season and Does it Ever End? Next Post:Should You Get Married in Winter?